Recently, a customer shared a story with us of how our SA-441 MagForce siren saved their department thousands of dollars. According to Deputy Sheriff Buck Fortner, Dallas County Sheriff’s Department Fleet Administrator, an officer was in an accident with another vehicle while going code 3 through an intersection. In the lawsuit that followed, the jury awarded liability judgements to several departments. However this is where it gets really interesting. The liability claim against the Dallas County Sheriff’s department was reduced by $100,000 as compared to the judgement levied against other surrounding departments because they run with the SA-441 MagForce siren. The jury cited the fact that the department used a certified 200 watt siren while the other departments used 100 watt sirens showed that they had gone beyond what most agencies do to minimize the risk to the community. Since then, several of the surrounding departments have installed the full 200 watt SA-441 MagForce siren. What sets the SA-441M MagForce Mechanical apart from other electronic sirens is the authentic reproduction of both a true Mechanical tone and a “Stutter” air horn sound. 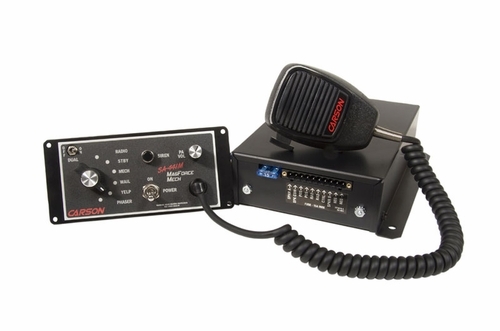 This combination offers an effective alternative to the costly Mechanical sirens and air horns that are traditionally installed on fire rescue apparatus. By eliminating the need for an exterior siren, as well as, air tanks, compressors and tubing, this compact siren is easy to install, space-saving and requires much less amp draw while still delivering that distinctive “Big Engine” sound. The features of this siren are easily selected at installation using an internal DIP switch. The SA-441M MagForce Mechanical siren is designed to power two 100-watt siren speakers and includes external fusing, short circuit, high voltage and reverse polarity protection systems. A detachable wiring connector and optional mounting bracket for the PA microphone are also included. As with all Carson Sirens products, the SA-441M MagForce Mechanical is backed by a no-hassle 5 year limited warranty. I had a Powercall in my truck prior to purchasing this siren. An ambulance service I was working for at the time put one of these in their new ambulance and I loved it so I went out and put one in my truck. Another employer of mine just put one in a new paramedic response vehicle and it clears traffic better than anything I've ever used. I'm now in the process of upfitting a pickup truck to be used by the fire department and will be ordering this siren for that too. At this point in time there isn't another product I would put in a vehicle if it were up to me. When I first hooked up the siren for a rest run with one speaker I thought it was much louder than my others. However, when I hooked the second speaker up and installed it I was able to clear traffic much faster than before. This is a must have for any volunteer or career firefighter,or EMT.